[RHS Encyclopedia of Conifers, Auders & Spicer] An upright, slow-growing plant with light, silvery Blue needles. Annual growth of 2-4 inches annually. 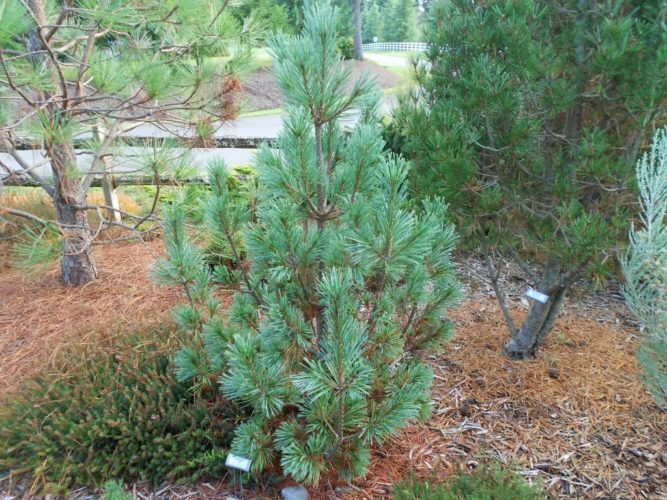 Originated through Jerry Morris around 1999 and is part of the Jerry Morris Collection of Rocky Mountain Conifers. This is a great plant for the smaller garden and will do best in the full sun, planted in well drained soil. Also noteworthy is that 'Snow White' is a good choice for planting in poor soil conditions. A six-year old specimen of Pinus monticola 'Snow White' at Glacier's End Arboretum, Olympia, WA. This tree was approximately 5 feet tall by 3 feet wide when this photo was taken in 2013.